You know how much I love going to the movie theater to share my love for horror films with too many people who have never heard of Emily Post. If that’s you, google it and then go to Amazon and buy the book. I believe manners are the only hope we have to save our society. When A Quiet Place released earlier this year, I was conflicted. I really wanted to see this movie. It was top on my list going into the new year and early reviews from critics and real people I trust were excellent. But everything about the title and the trailer screamed “shut the hell up” to an audience that I did not believe had the aptitude to remain . . . well . . . quiet. So I didn’t go. I also didn’t go to the theater for Winchester when it was released but for a different reason. The film got horrible reviews from critics and scored an embarrassing 14% on Rotten Tomatoes. I don’t need much of a reason to avoid the uncouth movie crowd and I need less of a reason to just be anti-social. That score was all it took. I mean, the movie world loved Get Out (99%) and hated Winchester and since I didn’t care for Get Out, how could Winchester be any good? See? This is the problem with movie reviews. The critics are ruining the experience for the rest of us. They are biased and they tell us what to watch and what to ignore. And damn it – we listen to them. How many times have you put a movie on your watch list, only to skip it once the reviews come out? How many of you went to the theater to see Winchester after seeing the RT score? Vudu has this cool feature where you can pre-order a not-yet-released video on disc and get instant access to the digital copy. It’s actually kind of dangerous. So when I was home from work due to illness one day, I took advantage of the instant gratification and purchased Winchester. It was supposed to be a crappy movie and I was feeling crappy so what the hell. Anyhow, I really love Helen Mirin and worst case scenario, I would get some much needed sleep. To my surprise, I was rewarded with a well written, well cast, and well executed film set in a real place with real history. A fictional story written around a house rumored to be haunted by victims of the Winchester rifle. A history that asks you to imagine the what ifs? What if the rooms were constantly built and rebuilt in order to free or contain ghosts? What if the reason some people could see the ghosts while others could not was ... well, that’s a spoiler. The film was criticized for its jump scares, and yes, there are those. But they were well timed and did not substitute for a suspenseful plot. (BTW…I love a good jump scare.) When you see Winchester, as I hope you will, keep in mind that the real Sarah Winchester was indeed an inventor and she was obsessed with the number 13, and see how these attributes are woven into the screenplay. I hope you look past the rotten review on Rotten Tomatoes and give this one a look. Let the critics know you are in charge of the movies you choose. 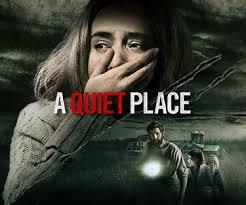 I had been told that my fears of seeing A Quiet Place in the theater were not founded – that the nature of the film practically ordered the audience to be quiet, and the audience complied. I waited anyway and then I watched it twice in the same week. The second time was to catch what I’d missed the first time. Am I the only one who thinks a good movie is better the second time? Well maybe not better but … deeper? Let me explain. Once you know how the movie ends, you can’t be surprised by the ending or the jump scares or anything else. (Although I still jump when Michael Meyers sits up in the original Halloween.) But I find that the second take frees me up to pay attention to the details I missed. It’s why debriefing a movie with friends is so much fun – everybody sees something somebody else missed. It’s also another reason to wait until the movie is available on streaming. The downside to watching at home is that distractions like dogs and refrigerators can really interfere with the story here. I missed a key piece at the very beginning the first time around while messing with the audio. Ironic, isn’t it? You barely have to watch the trailers for A Quiet Place to know that making even the slightest noise is bad. Like death bad. Talking is not allowed so there is very little dialogue – 25 lines in the entire movie and you’ll have to wait until you are almost half way into the film to start. It’s almost as if you are watching a really good silent movie. One that relies on great scenes and even greater acting which John Krasinski and Emily Blunt deliver in spades. Krasinski nearly turned the movie down because, like many actors, he doesn’t do horror. This is the point at which people challenge whether this move belongs in the horror genre. To answer that challenge, I go back to my first post ever and then suggest you decide for yourself. Just don’t miss this film, and then don’t miss it at least one more time.